Those guys at Bourgeois know about loud, wow, this guitar is loud! We are offering a new Bourgeois Slope D "The Standard" with an "Aged Tone" Adirondack spruce top and Mahogany back and sides. It's a fine, fine, super fine guitar. It really is the standard all guitars should be judged by. 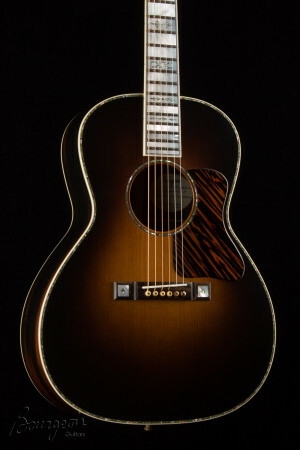 If you are familiar with late 40's early 50's Gibson J-50 and J-45 guitars, you'll know the sound I'm talking about, warm, rich, loud and succinctly brilliant. Dana Bourgeois' passion for acoustic guitars was fostered by those coveted instruments built in the pre-war era. "The Standard" model was inspired by the classic designs that emerged from the midwestern United States at that time, but incorporates many elements of Dana's own design. It starts with the striking Ziricote fretboard and bridge, beautiful in figure yet subtle enough to maintain the pre-war look. The single ring Ivoroid rosette and rectangular bridge hearken back to those old designs. Our contoured headstock was introduced with the L-DBO model, and fits the look perfectly! Upgraded with Floral fingerboard inlay, Cutaway, and Bound fingerboard and headstock. The OM is already a small guitar. 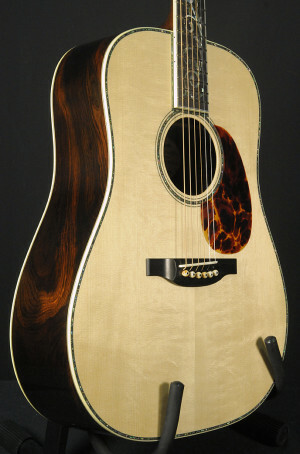 Its unique sound results from the ratio between its 25.5" scale length, the surface area of its soundboard, and the volume of its air cavity. The addition of a cutaway, therefore, is no small consideration. Harmonizing beautifully with the classic curves of the original OM outline, Dana's original cutaway offers three additional frets of accessibility while minimally altering the OM's critical proportions and characteristic sound.